Below: This is easily recognized as India-made by the "Tulwar" shaped handle. This one's handle is made of aluminum. The knife is completely sterile. A nice solid oval guard is made from steel of a good thickness. At close to seven inches in length, the blade is very typically Fairbairn in size and shape. The sheath does not fit it properly and may well be a long ago replacement. These knives are not easy to find. The chunky handle actually fits the hand quite nicely. This knife has a full length tang and top nut, unlike some Indian knives whose handles are soldered on. 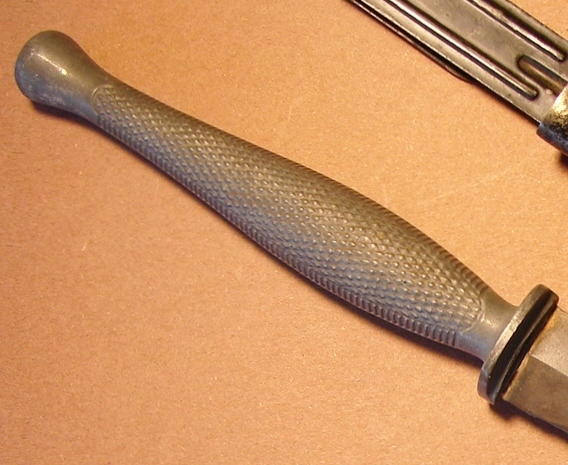 Below: Aluminum handled, theater-made, knife from WW-II. This is a very nice example of the work often turned out on board ships or in machine shops across this nation. For now this knife is a mystery. It fits my hand comfortably. There are no markings and it is another example of a nicely crafted Theater-made, knife. I bought it because I like the proportions and general design. 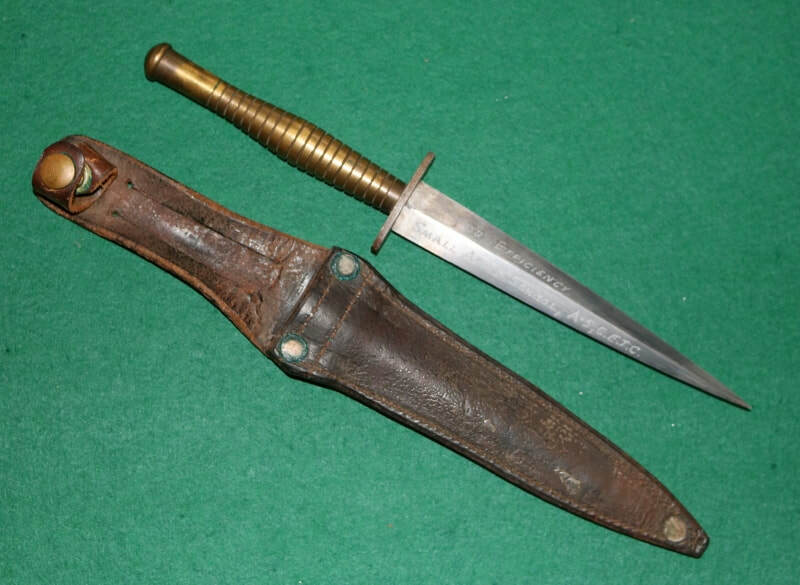 The blade is wider than a standard F-S so it was completely custom made, not adapted from an F-S.
Below: A WW-II commando style knife found buried in a northern European forest. It was made by Wm. Menke & Co. Please contact me if you have any information concerning this company. This knife is a little larger than the standard British models. ﻿﻿﻿﻿Below: Author and collector Ron Flook provided me with these photos of a knife identical to the one I bought. His knife came from Canada, I forget where mine came from. So now we know there were at least two of them, making my guess that the number 33 is probably a serial number more likely correct. How many were made may never be known unless someone happens upon this site and has knowledge of the maker. Stranger things have happened. 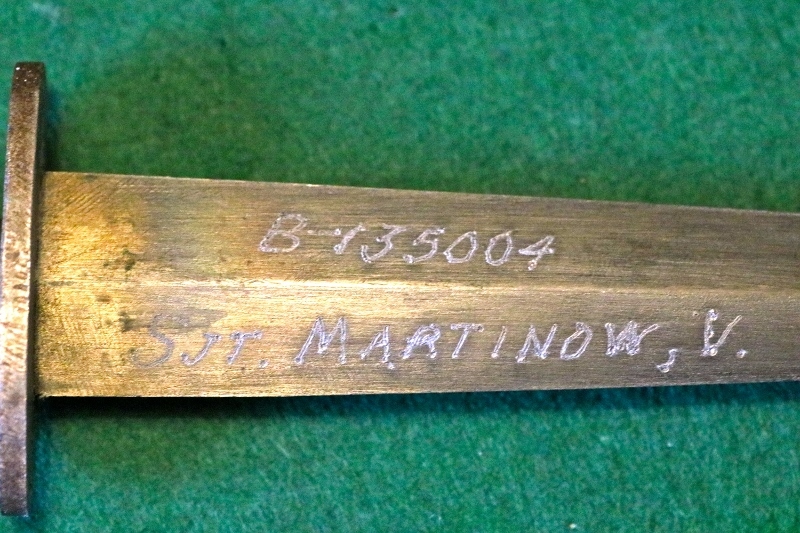 This knife includes a very nicely made sheath and an unusual inscription. This knife is stamped "43". 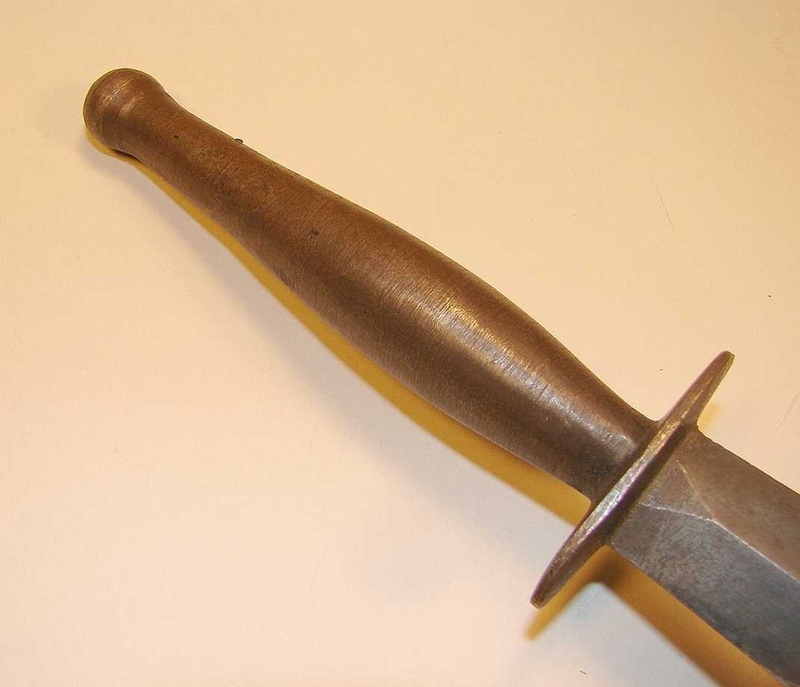 Here is some additional research on this style knife provided by a visitor to our site. "I am Canadian and a history buff and collector. I have a number of F-S knives and other types of Militaria. I saw the picture of your knife and decided to do some investigating. I believe you are right that it is Canadian and probably not made in large numbers. I found a site “Canadian Army Training Centres of WW2. “ I found that A5 C.E.T.C. stands for A5 Canadian Engineer Training Centre at Camp Petawawa, Ontario. The Camp was founded in 1905. The number above the name is a Canadian Regimental number of WW2. In that war the soldiers Regimental number started with a letter, such as A, C, D, etc. or in this case B. This signified the area of the country the soldier came from. B tells us this soldier was from central Ontario Military District 2. This was not done in WW1 nor later I am not sure about the Korean War but I don’t believe so. Probably they were made in a shop on the base in small numbers. That’s Just my guess. I enjoyed doing the search. I like your site. I hope this helps you. Thanks to Mr. Johnson for his assistance! 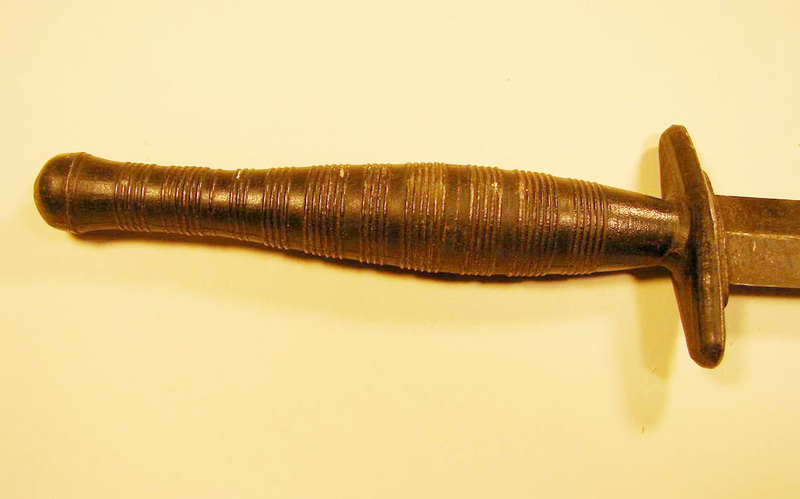 Below: An extremely well made and unusual knife with turned bronze handle. It is marked on the guard "33". I am going to attribute it to India or that part of the world. If you have seen any others please email me. It turns out these are probably a Canadian product! 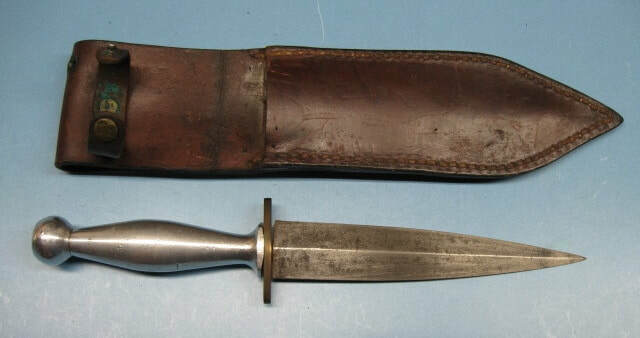 Below: The blade on this knife is a thin, roughly finished blade, similar to a late war or post-war P-3. It is illustrated with its original sheath, a style often referred to as a "hunting" knife sheath. There is no known manufacturer as this is written. The prices asked for these knives have sky-rocketed based perhaps in part by my description of how uncommon they are. The quality is only fair compared to other knives of the era. 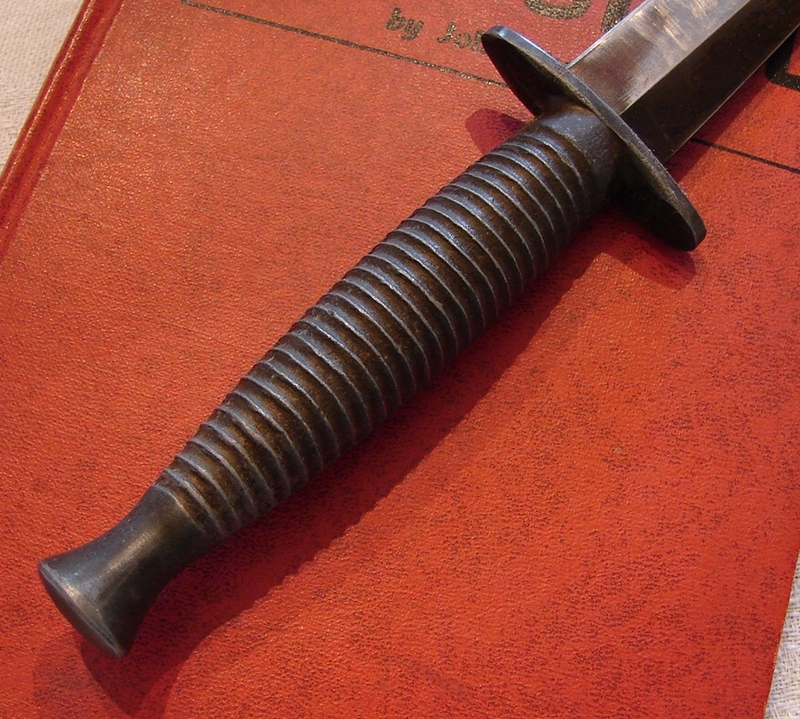 Below: Close-up of the unusual alloy handle with its integral guard. The handle is cast directly onto the tang of the blade. In construction these knives bear a resemblance to the USMC Stiletto, especially the details of the guard. Perhaps it was American made but no one seems to know for sure. About 80% of the original black paint remains on the handle. I have a second copy of this style of knife which I actually bought much earlier and at greater cost. That knife has the blade badly shortened by evidently a serious break. 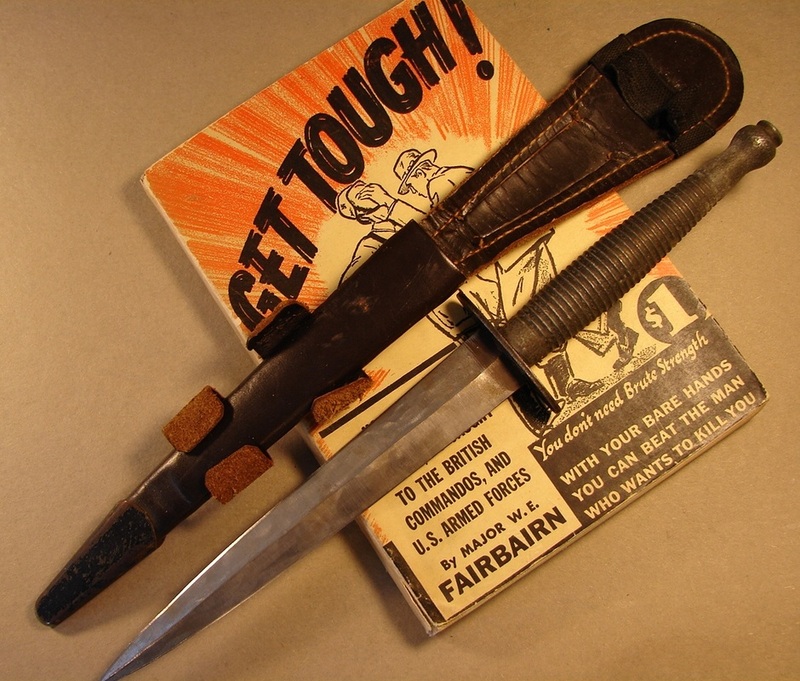 (Many a fine knife was destroyed or damaged by a soldier thoughtlessly using it as a throwing knife.) When I got this one it had already been roughly re-tipped and had a sheath made specifically for it in its new shortened condition. This knife is ilustrated in Homer Brett's magnum opus on military knives. There is an inexpicable saw cut into the handle and in the recesses of the rings blackish-green paint flecks are visible. Was this paint a later addition or the original color, somehow removed? assumption it was post-war, possibly of Indian Manufacture. Once it arrived and I had the opportunity to examine it I found that it was more likely a "Theater-made" knife. Many of these knives were said to be crafted by machinists mates aboard ships where there was access to mills, lathes, and drill presses. The reason for my change of opinion is shown in the second photo. What you are seeing are the remnants of file teeth. 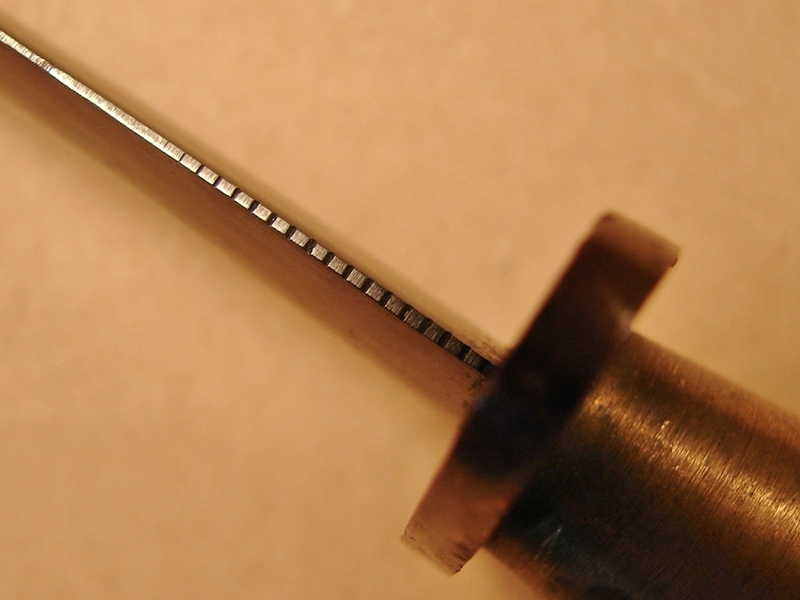 Therefore we know the blade was made from a file.The precision of the turned brass handle also suggests the work of a machinist with an eye for shape. The guard appears to be made of copper or a red bronze. Overall it is a well made knife. Some of the knives shown below are also featured in several other sections including this MacLeod Metallurgy Cast Steel one piece knife. Below: This is a very rare version with a hexagonal alloy handle. Above: Octagonal alloy hilt. More info under the Rarest of the rare page and another example on the "The Stories" page. Above: Uncommon combination of P-2 and P-3 design elements. I think these knives were produced by Crown Sword, post-war probably. 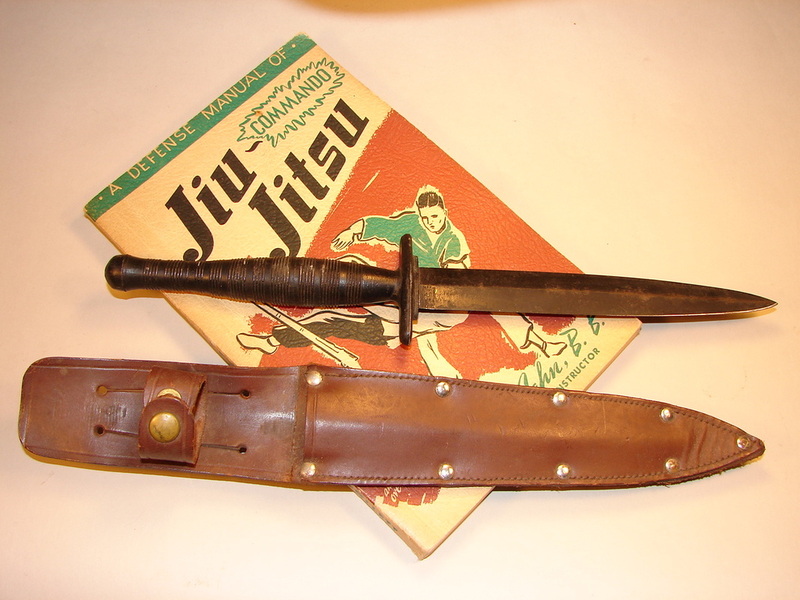 Above: German Post-War knife with one piece guard and handle. Above: USMC Stiletto with both arms to the guard broken off. 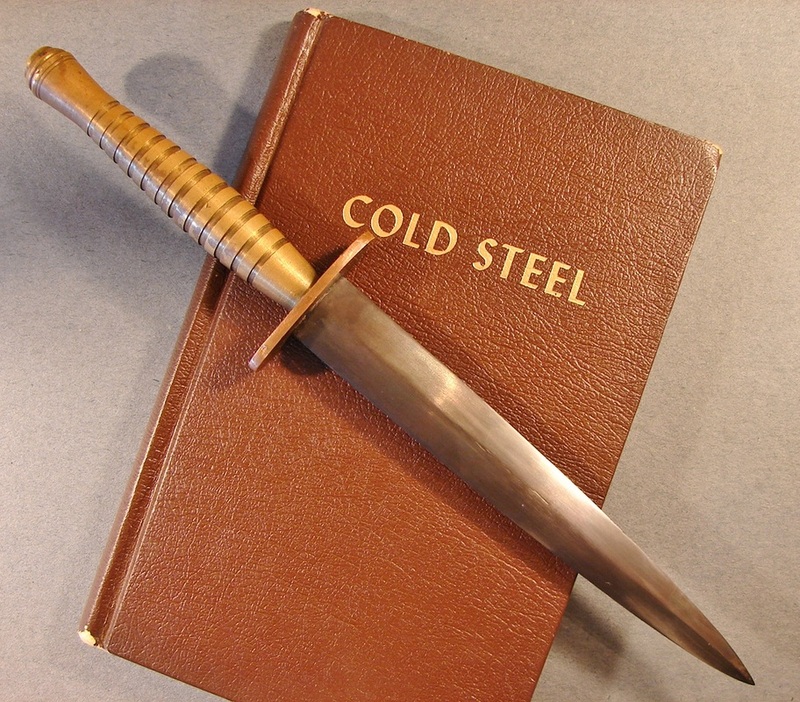 There is more information on this knife under the topic of OSS and USMC Stilettos.